Three different publications recently ran some of my materials covering the Baptist World Congress this summer in South Africa. I previously reported on the gathering for Ethics Daily and Churchnet, and had photos published by Ethics Daily, Churchnet, and Baptist News Global. 1. An October 2 column for the Baptist Times (news outlet in the United Kingdom) ran a photo I took of Churchnet Executive Director Jim Hill at the Congress. The piece is a good reflection on the Congress and how to respond to the refugee crisis. 2. 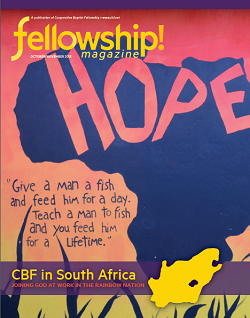 The October/November issue of fellowship! (the magazine of the Cooperative Baptist Fellowship), focuses on the Congress. It includes a photo I took of the International Convention Center in Durban. 3. 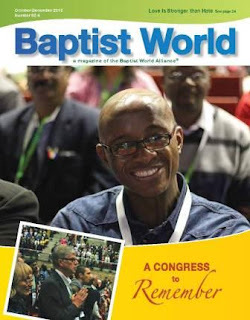 The October-December issue of Baptist World (the magazine of the Baptist World Alliance) also focuses on the Congress. It includes an article I wrote about breakout sessions on South Africa's Peace & Reconciliation Commission and a photo I took of Peter Chin of the Republic of Korea. I am thankful for the opportunities to help share about the Congress.